For a splash of indulgence, board a luxury charter and discover Port Phillip Bay in Style. Swim with dolphins and seals, snorkel, or simply soak up the sun out on the deck. 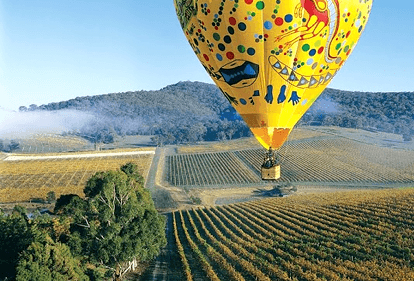 Visit Domaine Chandon, one of the Yarra Valley's stunning vineyards, for world celebrated sparkling wine, and gourmet platters filled with fresh, local produce. Wind down with a treatment at an award-winning Daylesford Day Spa, or by teeing off at one of Australia's top 10 golf courses, such as the Shearwater Cape Schanck Resort, surrounded by spectacular ocean views and magnificent natural landscapes. Whether discovering Australia's gold-mining history at an historical township such as Ballarat, or getting up close and personal with wildlife and penguins at Phillip Island Nature Parks, visit regional Victoria for an unforgettable experience of Australia. Australia is a land of many opportunities for visitors. It contains a breathtaking diversity of natural landscapes from the snow-capped mountains of the Southern Alps to the lush rainforests of the tropical north, and from the spectacular surf beaches of the coast to the wide open spaces of the Australian Outback. No visit would be complete without exploring some of Australias natural heritage icons, such as the Great Barrier Reef, Kakadu National Park and Uluru. Just as distinct are Australias cities, where our laid back lifestyle and cosmopolitan culture meet. You will find a melting pot of cultures and a medley of theatre, restaurants, nightlife and events. Come, stay and celebrate, then spring into the rest of your Australian holiday.